The recognition that social safety is a parallel requirement for economic success, and the revelation that unconditional safety is both the natural expression of solidarity and the key to liberating economic performance, has unveiled a new economic model for human society that will transform the 21st Century into a new age of enlightened prosperity. The battle to figure out how to afford the society we want is the political challenge of our generation. Solving that problem reveals the first new economic model in 100 years. On the one side we have those demanding better social support, and on the other there are those who see the only workable option as NeoLiberal Puritanism. Because it looks unaffordable to have decent social support, one side invents “magic money” to pay for it, and the other side says that we simply can’t afford it. They are both ignoring reality because they don’t see any other option, but there is. Investing in the infrastructure for universal social safety creates a more dynamic, lower cost economy that is fiscally, socially and environmentally sustainable with low growth. Securing the benefits of large societies requires the delivery of basic life supporting services unconditionally and universally. This is necessary to maintain cohesion, and to enable the diverse contributions of the individuals in the society. Up until now economic models have assumed that such a service infrastructure would be unaffordable from a reasonable tax on the monetary economy, however new modelling shows that the consequent reductions in basic labour rates, and increased demand efficiency of universal social safety services, make the services more affordable than cash benefits, and delivers a host of important economic advantages not available from the 20th Century NeoLiberal economic model. Chief amongst the advantages of the move to universal services is the consequent reduction in labour rates, reducing monetary cost across the entire economy as well as in the delivery of the universal services themselves. The cost reduction materialises without legislation by allowing labour rates to float naturally in the market, without affecting the basic safety of the society that hosts the economy. The portion of labour rates that is equivalent to the value of the services is unconsciously socialised by each individual according to their valuation of the services. This effect is exponentially realised once the services achieve the ability to support life unconditionally. The gross impact on a modern industrialised economy is a 10% reduction in overall labour costs in the economy. Universal safety services must necessarily be primarily delivered locally at a community level, and at that level the increased efficiency of demand management yields more than 10% budget savings compared to the existing system of centrally administered benefit distribution. This is supported by early research in a joint report by the RSA and the LGA which suggests a 14% saving is possible. Given a maximum tax burden on economic activity of around 40%, universal safety services can deliver comprehensive social cohesion and economic liberation unaffordable using a cash benefits system. Societies can afford comprehensive social security without debt, and are therefore not dependent on perpetual economic growth and resource exploitation to justify high debt levels. 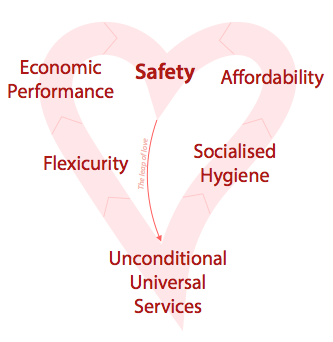 Through a combination of liberating marginal micro economic activities, and supporting risky experimentation that is the root of innovation, universal safety services create the foundation for the most vibrant, dynamic and efficient economy yet. Instead of being confined to the activities defined by large economic units as economically effective, the diverse population of a large society is freed to make every marginal economic contribution imaginable. Many of these marginal activities dramatically increase the efficiency of resource use. Ordinary people gain freedom, safety and joy along with retaining a greater portion of their pay for their personal use. Businesses gain lower cost labour and much greater labour flexibility, as well as the ability to experiment more adventurously. Democracy is enlivened with much greater power and participation in a bottom up structure that empowers citizens to effect their personal lives and communities. Greater use of more efficient infrastructure services and reductions in the cost of mitigation and adaptation investments gets us to environmental balance faster and more easily. The social safety net shields the least advantaged from the short term costs of migrating to a sustainable energy infrastructure. Liberated from the burden of social responsibility, the monetary system and financial sector is freed to properly recognise both losses and gains, stabilising the system and removing distortions required by the NeoLiberal model which makes social survival dependent on monetary policy. Planet destroying industries get the opportunity to move to more useful activities without disrupting the societies that depend on them today. Anyone attached to economic models that don’t work.